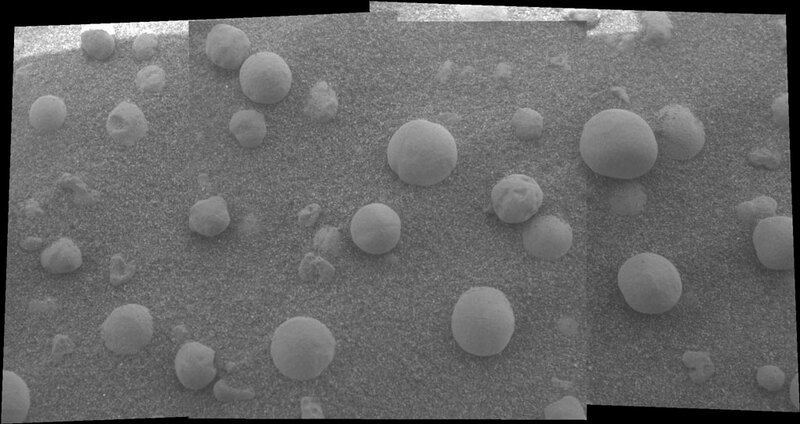 This image from the Opportunity rover shows an extreme close-up of round, blueberry-shaped formations in the martian soil near a part of the rock outcrop at Meridiani Planum called Stone Mountain. NASA's Mars Exploration Rovers are not only providing scientists a flood of information about Mars -- including new insights today about winds -- they are also adding excitement to classrooms throughout the nation. An assortment of programs giving students first-hand opportunities to work with information from NASA Mars missions help young people "see themselves as scientists in the future because they understand the process of science," said Sheri Klug of Arizona State University, Tempe, and NASA's Jet Propulsion Laboratory, Pasadena, Calif. She coordinates NASA Mars education programs for kindergarten through high school, part of the agency's goal to inspire the next generation of explorers. Silver Stage High School in Silver Springs, Nev., is one of 13 schools participating in one program that pairs selected students with researchers on the rover missions. "I actually get the opportunity to work with the scientists. It's really awesome!" said Shannon Theissen, 16, a Silver Stage junior. Dr. Wendy Calvin, rover science team member from University of Nevada, Reno, and Shannon's mentor for a week at JPL, said, "This is the real stuff, not baby steps. The students are using the same tools we do." Hundreds of other students from around the country participate in programs using pictures and other information from NASA Mars orbiters, and more than 1,000 have sent in rocks for a project to compare Earth rocks with Mars rocks. Meanwhile, noted Art Thompson of JPL's rover flight team, "We have two very busy rovers on the surface of Mars." On Wednesday, Spirit broke its own record set earlier in the week for the longest one-day drive on Mars. The rover added 24.4 meters (80 feet) to its odometer, bringing the total to 57.4 meters (188 feet) and ending its day near a cluster of rocks dubbed "Stone Council." In coming weeks, scientists and engineers plan for Spirit to drive up to the rim of a crater dubbed “Bonneville," still more than two football-field lengths away, in hopes of peering inside and seeing rock layers that could tell the geologic history and the potential role of water at the Gusev site. Opportunity drove Friday morning to the fourth counterclockwise position in its survey of a rock outcrop along the inner slope of the crater in which it landed. Based on the survey, scientists will choose a small number of locations on the outcrop to come back to for more thorough examination later. The flight team has learned to compensate for wheel slippage in the soil on the slope. "When we attempt to drive up the slope we intentionally overdrive, and when we drive down a slope we intentionally underdrive," Thompson said. Both rovers have used an infrared sensing instrument called the miniature thermal emission spectrometer to study the sky, as well as the ground. These atmospheric observations are revealing rapid temperature changes in the lower atmosphere. In mid-morning, the air temperature at about the height of an eight-story building swings up and down by several degrees within a minute. "Warmer and colder blobs of air are intermittently passing over the rover," said Dr. Don Banfield, a rover science team collaborator from Cornell University, Ithaca, N.Y. "We're watching the overturning of the atmosphere as it's warming up in the morning." Rising warmer air carries heat to upper layers of the atmosphere. Observing the details of these changes helps scientists improve their models for understanding Mars' winds. Better understanding of Mars' winds is important not only for the design of future landings on the planet, but also for interpreting some features on the surface. "We've been talking a lot about water on Mars in the past, but wind is currently the important agent of change on Mars," Banfield said. Microscopic images indicate that windblown sand is eroding the outcrop that Opportunity is studying. Dr. Mark Lemmon, science team member from Texas A&M University, College Station, said that taking a series of images with that instrument at slightly different distances from the target allows creation of a three-dimensional view. "We're gathering as much information about the things we're looking at as we possibly can," he said. The main task for both rovers in coming weeks and months is to explore for evidence in rocks and soils about whether the landing-site areas ever had environments that were watery and possibly suitable for sustaining life. JPL, a division of the California Institute of Technology in Pasadena, manages the Mars Exploration Rover project for NASA's Office of Space Science, Washington, D.C. Images and additional information about the project are available from JPL at http://marsrovers.jpl.nasa.gov and from Cornell University at http://athena.cornell.edu . Information about NASA school projects is available at http://education.nasa.gov .